As a trainee, learns techniques for conducting environmental health inspections and investigations. Under close administrative and technical supervision, positions allocable to this class receive a maximum of two years of extensive formal and on-the-job training in techniques and procedures for conducting environmental health inspections, investigations, and enforcement, as well as application of these techniques and procedures in the field, in compliance with Federal, State, and County public health laws, and with policies and procedures governing the environmental health program. Attends formal training sessions to receive instruction in environmental management principles, methods, and techniques and orientation to the organization, departmental policies, and procedures of the Environmental Health Program. Learns to conduct periodic inspections of food establishments and restaurants for proper sanitary conditions by reviewing and observing to ensure that food is unspoiled, properly labeled, stored, handled, and protected from contaminants. Reviews and observes utensil washing and sanitizing procedures by testing water temperatures and cleaning agents and facilities to ensure that these meet Federal, State, and local legal requirements. Ensures that food equipment, such as stoves, and refrigerators, and other cooking equipment and appliances are clean and in good repair. Learns to conduct investigations of complaints concerning the infestation of rodents, and inspects by examining premises for evidence of infestation such as telltale signs and avenues of entry and placing poisons. Learns to conduct investigations of complaints regarding improper disposal of garbage, rubbish and sewage, and other unsanitary conditions in buildings, dwellings and retail food or other establishments by conducting inspections of premises for adequate disposal facilities. Learns to conduct investigations concerning the disposal of garbage, rubbish and sewage under public health laws by inspecting the collection trucks, sanitary landfills, recycle sites, and refuse transfer stations used by private residential refuse collectors operating in unincorporated areas and contract cities to ensure that collection trucks are in good repair, properly covered and no spillage, and that landfills, recycle sites, and refuse transfer stations do not provide insect or rodent harborage or emit excessive odors or dust. Meets with community groups within an assigned area and attempts to establish rapport for the purpose of solving problems related to environmental health. Learns to participate in prosecution of environmental sanitation cases of non-compliance with public health laws and regulations by preparing evidence such as meat samples and the findings of laboratory technicians who conducted the tests, completing inspection forms, attending office hearings, conferring with city or the district attorney, and testifying in court as a representative of the Department of Public Health. Must possess, a letter** from the California State Department of Public Health verifying eligibility to work as an Environmental Health Specialist Trainee, dated no earlier than 30 months from the date of application. YouMUSTattach a legible photocopy of the required letter from the CSDPH, dated no earlier than 30 months from the date of the application, verifyingeligibilityto work as an Environmental Health SpecialistTraineeat the time of filing. 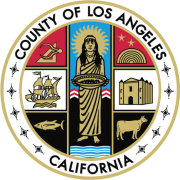 If you are unable to attach the photocopy of the letter to the application you may e-mail the document to mofong@ph.lacounty.gov within 15 calendar days of filing.If submitted after the time frame your application will be considered incomplete and not accepted. A valid California Class C Driver License is required to carry out job-related essential functions. Please make sure you fill out the license section of your application. In addition youMUSTattach a legible photocopy of the required valid California Class C Driver License at the time of filing.If you are unable to attach the photocopy of the license to the application you may e-mail it to mofong@ph.lacounty.gov within 15 calendar days of filing.If submitted after the time frame your application will be considered incomplete and not accepted. Successful applicants for positions that require driving must obtain and present a copy of their driving record from the California State Department of Motor Vehicles before final appointment. Applicants should not present a copy of their driving history until asked to do so by the hiring department. The County will make an individualized assessment of whether an applicant's driving history has a direct or adverse relationship with the specific duties of the job. Driver license must not be currently suspended, restricted, or revoked. 3 - Moderate.Includesstanding or walking most of the time, with bending, stooping, squatting, twisting, and reaching; includes working on irregular surfaces, occasionally lifting objects weighing over 25 pounds, and frequent lifting of 10-25 pounds. PART I:A Written Test weighted 35%covering the following: Customer Service, Written Expression, Data Analysis & Interpretation (including Mathematical Ability) and Reading Comprehension. Only those candidates who achieve a passing score of 70% or higher on Part I will be eligible to proceed to Part II . PART II:A structured oral examination (interview) weighted 65% covering the following: Interpersonal/Oral Communication/Customer Service Skills, Analytical& Decision Making Ability, Work Skills and Adaptability & Dependability. Candidates must meet the Selection Requirements and achieve a passing score of 70% or higher on each weighted part of the examination in order to be added to theEligible Register. Candidates that have taken identical test part(s) for other exams within the last 12 months, will have their test responses for the identical test part(s) automatically transferred to this examination.This examination contains test part(s) that may be used in the future for new examinations. Upon acceptance of your application, your test responses will be transferred to the new examination and you may not be allowed to retake any identical test part(s) for at least 12 months. Test invitations and/or notifications will be sent electronically to the e-mail address provided on the application. It is important that candidates provide a valid e-mail address. The notifications will also be sent to your inbox on My Career Page Website . Please add mofong@ph.lacounty.gov to your e-mail address book and list of approved senders to prevent email notifications from being filtered as spam/junk mail. Non-Acceptance and Final Examination Results letterswill be sent viaUnited States Postal Service(USPS).Examination scores cannot be given over the phone or by e-mail. Applicants with disabilities who require special arrangements must provide the Examination Unit with written notification at the time of filing. An interactive Online Test Preparation System for taking practice tests may be accessed on the Department of Human Resources' website at: http://hr.lacounty.gov/ . Click on "Find a Job" andthen click on "Job Search Toolkit. "Test Preparation Information is located under the "Employment Test Assistance" section. While these study guides will help in preparing for the test, we advise you to review all related materials that you deem necessary. The names of candidates receiving a passing score in the examination will be added to the Eligible Register in the order of their score group for a period of 12 months following the date of eligibility. Complete applications with a photocopy of official Bachelor's diploma or transcripts, photocopy of valid CSDPH letter, and photocopy of valid California Driver License will be processed on an as-received basis and those receiving a passing score will be promulgated to the Eligible Register accordingly. No person may compete for this examination more than once in a 12 month period. The resulting Eligible Register for this examination will be used to fill temporary vacancies in the Department of Public Health Environmental Health Services Division, as they occur . Appointees will be required to work any shift, including evenings, weekends, and holidays. *In order to receive credit for any college degree youMUSTattach a legible photocopy of the official diplomaORlegible photocopyofthe official**** college transcript(s) with date the degree was conferredwith your application at the time of filing. If you are unable to attach the photocopy of thediploma or photocopy of the transcriptsto the application you may e-mail the document to mofong@ph.lacounty.gov within 15 calendar days of filing.If submitted after the time frame your application will be considered incomplete and not accepted. ****Official Transcriptis defined as a transcript that bears the college seal and states "official and/or copy" issued by the school's Registrar Office.Aprintoutof the transcript from the school's website is NOT considered official and, therefore, it will NOT be accepted and will result in your application beingREJECTED as INCOMPLETE. For applicants with international transcripts, a report by an evaluation agency recognized by The National Association of Credential Evaluation Services or the Association of International Credential Evaluators, Inc. Applications must be filed on-line only. Fill out your application andsupplemental questionnaire completely. Provide any relevant education, training, and experience in the spaces provided so we can evaluate your qualifications for the job.Resumes cannot be accepted in lieu of online applications. All information is subject to verification. We may reject your application at any time during the examination process. The acceptance of your application depends on whether you clearly show that you meet theSELECTION REQUIREMENTS. Please fill out the application completely and correctly so that you will receive full credit for related education, work experience, and receive all corresponding letters/e-mails regarding your exam status. Be sure your application shows complete information, including dates for education and jobs held which relate to this position. In the space provided for education, include the names and addresses of schools attended, titles of courses completed, dates completed, and number of credits earned. Applicants must submit their applications by 5:00 p.m. (PST) on the last day of filing. NOTE : NO ATTACHMENTS MAY BE APPENDED TO YOUR ON-LINE APPLICATION ONCE YOU PRESS "SUBMIT. "To avoid your application rejected as incomplete, have ALL required documents (i.e. CSDPH letter, California DriverLicense, Official Transcripts or Diploma, etc.) uploaded as attachments BEFORE submitting your on-line application. If you are unable to attach the required documents to your application, you may e-mail them to Monica Fong at mofong@ph.lacounty.gov within 15 calendar daysfrom filing or your application will be rejected as incomplete. Please include your name, exam number, and exam title on all e-mail correspondence. Documents submitted after the end of the filing period will not be considered as part of your application submission. For candidates who may not have access to a computer or the internet, application and SupplementalQuestionnaire Form can be completed on computers at public libraries throughout Los Angeles County. Candidates must upload any required documents as attachments during application submission. If you encounter problems uploading your attachments, you may e-mail the supporting documents to mofong@ph.lacounty.gov within 15 calendar daysof filing online.Please include your Name, Exam Number and the Exam Title on e-mail correspondence. Visit http://hr.lacounty.gov to view the above information.